Fluid serum for the face with lifting, anti-wrinkle and moisturizing action, featuring a combination of hyaluronic acid, vitamins E and B3 and Chamomile extracts. This association of high-performance elements naturally fills in fine lines and wrinkles, smoothing, nourishing and protecting the skin. 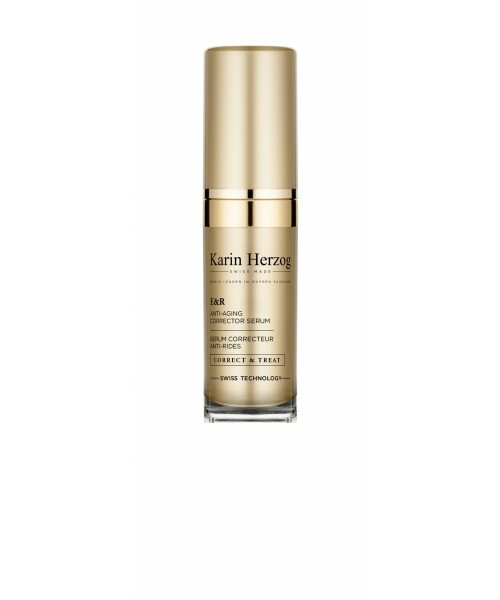 E&R serum enjoys remarkable effectiveness against the advancing signs of aging and established wrinkles. It restores youthfulness and vitality to the skin. Use in the morning. Shake the bottle before use. Apply to cleansed skin focusing the application on lines and wrinkles. Leave to dry. Follow with a Vita-A-Kombi cream. Wait several minutes before applying makeup. Aqua; Alcohol denat. ; Polysorbate 80; Tocopheryl acetate; Sodium hyaluronate; Chamomilla recutita flower extract; Salicylic acid; Niacinamide; Formic acid.